We offer three "step-by-step" Balanced Scorecard Executive Education Courses. At Bob Paladino & Associates, we have the only step-by-step training developed and endorsed by Bob Paladino, who directed Crown Castle's performance management program that earned Drs. Kaplan and Norton's Global Balanced Scorecard Hall of Fame Award. Bob has worked with over a dozen Balanced Scorecard Hall of Fame winners. Our course has helped businesses improve cash flow by $500 million, and increased employee satisfaction by more than 25%. It also increased customer satisfaction by more than 30% while reducing order to cash cycle time by more than 75%. 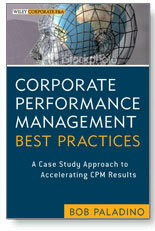 Additionally, it increased best practice usage across the board. "Bob Paladino's observations and principles are firmly rooted in the Kaplan/Norton Strategy Focused Organization (SFO) Methodology." "Very practical examples and templates...no need for theory"
"The instructor actually won the Hall of Fame Award and has real life experience"
"The training is so clear and easy to follow. We saved so much time"
Wiley & Sons Global Best Selling Book From Bob Paladino "Five Key Principles Of Corporate Performance Management"